Hundreds of thousands of striped bass were recently stocked by the S.C. Department of Natural Resources in Lake Moultrie and Lake Greenwood. Some 175,000 striped bass fingerlings were placed into Lake Moultrie as part of an overall S.C. Department of Natural Resources (DNR) stocking program that annually produces between nine and 12 million fish that are released into public waterways. On that same day, May 27, in the heart of the state's piedmont region, similar efforts were underway at Lake Greenwood, where about 40,000 striper fingerlings were released, joining another approximately 100,000 that were released there just four days earlier. State Rep. Mike Pitts of Laurens, who attended this stocking, noted the importance of managing the lake's fishery to the local economy. "This lake is an economic engine for both Laurens and Greenwood counties, and the region" said Pitts, "so the more people that use it, the better off we are. It’s a long cycle that starts off with putting these fingerlings in the lake." Other elected officials are also keenly aware of the importance of natural resources to the areas they represent. State Rep. Anne Parks of Greenwood joined Pitts and DNR biologists at the Greenwood stocking, and state Sen. Larry Grooms of Charleston lent a hand at the Moultrie stocking. Early spring is a busy period for the staff at the S.C. Department of Natural Resources' Jack Bayless Fish Hatchery in St. Stephen, where millions of striped and hybrid bass are produced for annual stocking efforts in lakes around the Palmetto State. About 12 million "fry" will be produced at the facility this year, according to Forrest Sessions, DNR fisheries biologist and hatchery manager, and those fish are stocked in the Santee Cooper Lakes (Moultrie and Marion), as well as lakes Murray, Greenwood and Wateree (striped bass only), and lakes Thurmond and Hartwell (hybrids and stripers). Bayless Hatchery is an important component of a comprehensive DNR hatchery program that includes four other warmwater hatcheries around the state, and a coldwater trout hatchery located near Walhalla in the Upstate. In addition to striped and hybrid bass, the DNR’s hatchery program produces rainbow, brook, and brown trout; largemouth, white and smallmouth bass; bluegill, redear (shellcrackers) and redbreast sunfish; crappie; channel and blue catfish; and robust redhorse. Hatchery-reared fish are stocked in the state’s rivers, major impoundments and smaller DNR-managed fishing lakes. The goal is to provide South Carolina’s citizens and visitors with the best recreational fishing opportunity possible while protecting and conserving our aquatic resources. 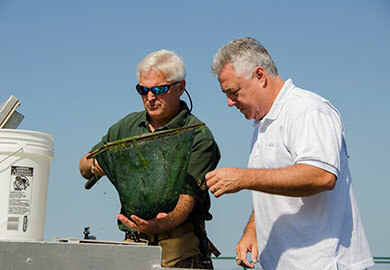 "The products of these hatcheries go into public waters to support sportfishing in South Carolina," said Ross Self, DNR freshwater fisheries chief. "We have species that we are able to provide fishing opportunities for in some areas of the state that would not be available were it not for the hatchery program and the fish that come out of our production facilities. For instance, in addition to stripers, we would have very, very limited trout fishery in South Carolina were it not for the hatchery program, and we have had very good success in the last few years with the supplemental stocking of redbreast sunfish in some of our coastal rivers." "We stock striped bass to supplement natural reproduction, and without that supplement, we'd have wide fluctuations in numbers at Lake Moultrie, so it’s essential to maintaining a good fishery" said Scott Lamprecht, DNR regional fisheries biologist. "We've had a very restricted harvest in place here for eight years, and we are starting to see the fruits of that effort and of the sacrifices that those anglers have made." "Our goal is to provide quality experiences for our constituents, in hopes that if they go out and enjoy our natural resources, then they will want to share those opportunities with others, said Emily Cope, DNR deputy director of wildlife and freshwater fisheries, who also attended the Greenwood stocking. "That will allow us to continue the traditions of hunting and fishing in South Carolina and continue to educate everyone on the importance of conservation." Recreational fishing is a multi-million dollar economic driver for South Carolina. Anglers spend more than $680 million in the Palmetto State annually, according to a national survey conducted by the U.S. Fish and Wildlife Service and the U.S. Census Bureau (PDF). That's part of an estimated $2 billion total, spent on wildlife-related recreation in South Carolina each year. Located in St. Stephen, the Jack D. Bayless hatchery is the center for all hatchery-reared striped bass produced in South Carolina. Each spring, when adult wild striped bass migrate upstream in an attempt to access spawning grounds. 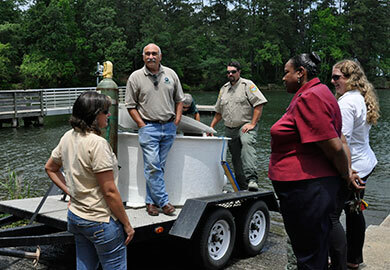 Bayless Hatchery staff travel South Carolina’s rivers to electro-fish male and female striped bass. Broodfish are transported back to the hatchery and placed in holding tanks. Captive spawning is a complex and carefully controlled process that produces millions of larval striped bass that are then transported to Dennis Center and other hatcheries for rearing. Striped bass larvae produced at Bayless Hatchery grow to a harvestable size in about 35 days. At harvest, ponds are drained into a basin where fisheries staff seine fingerlings and place them on a hauling truck for transport to stocking locations. About, 75,000 fingerlings can be produced in a one-acre pond. The techniques for hormone-induced spawning of striped bass were developed in South Carolina in the 1960s. This pioneering research (much of it refined by DNR fisheries biologist Jack D. Bayless while working at the original state striped bass hatchery on the Cooper River) made possible the artificial production of striped bass larvae and eventual stocking of fingerlings in inland reservoirs throughout the United States.